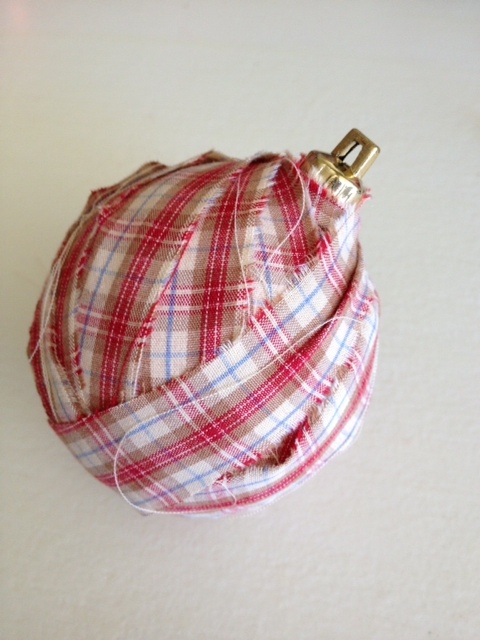 Some years ago I was watching HGTV and they were decorating a house for Christmas by upcycling men’s shirts into these cute plaid Christmas ornaments. I remember loving them so much but then I forgot about them. Then this year I was thinking about how I wanted to decorate my tree. I’ve had the same decorations for six years so I was ready for a change. 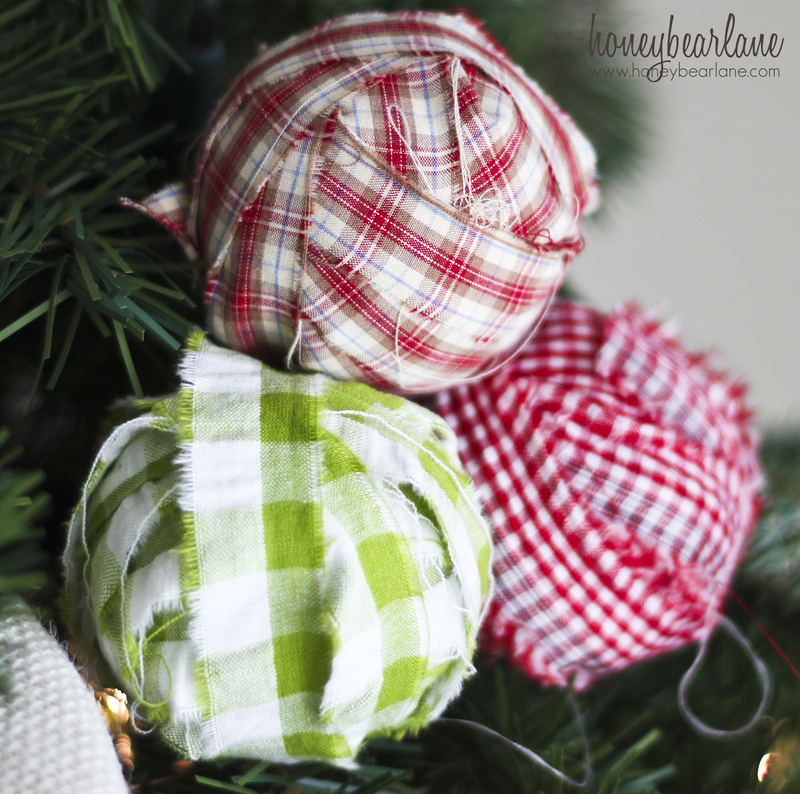 I wanted to go with more natural and country looking elements, so I used natural ‘winter’ fabrics, like sweater cable knits (like in my sweater pillow) and these flannel shirt Christmas balls. Don’t you love them? I can’t wait to show you my finished tree–except it isn’t finished yet so you’ll have to wait a bit. This is the part where I get chastised for skipping over Thanksgiving and celebrating Christmas too early. Well here is my defense: In my mind, Thanksgiving and Christmas don’t really have to be completely separate and defined. 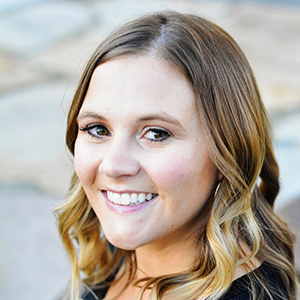 They are pretty similar in the overal feeling of love, family, and gratitude. And I ADORE having that feeling for two entire months. Thanksgiving is a glorious time when the weather is chilly and people get a break from work and school. We get together to eat lots of yummy food and vocalize our gratitude for our many blessings. Then the Christmas shopping and decorating commence that same weekend. It’s always been that way for me, ever since I was a little girl. And as an adult, it remains the same, because I still do Christmas decorating and shopping on Thanksgiving weekend–but it’s for my parent’s house. My mom does not love decorating for Christmas so I’ve kind of been in charge of it since I was about 15. I do it every year. So by putting up my own decorations before Thanksgiving, it gives me time to enjoy doing it for my house and to enjoy doing it for my mom’s house. And as a blogger, I like to be able to inspire you by sharing my projects before you have started your own. Let everyone celebrate the holidays in their own way–to each her own. But here’s how you make them–they are very easy! Click to keep reading. Lots of people use foam balls for these type of projects. Foam balls are easy, it’s true. But I think to get a lot it can get expensive. So I used my 40% off coupon to purchase a HUGE box of plastic Christmas balls from Hobby Lobby and I think I got like 50 for $10. Seeing as the foam balls are like $3 for 5, I think it’s a good deal. And yes, you can see my reflection of me taking a picture with my phone. Ha! 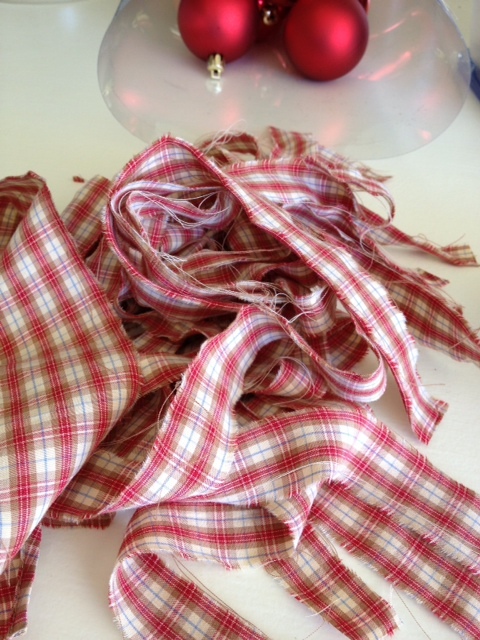 For the fabric, I bought a few plaid shirts from a thrift store and ripped them into narrow strips, about an inch wide or less. I wanted to rip them instead of cut because it gives it an even more rustic look. The shirts ripped very easily. I also purchased some plaid fabric because I liked the pattern but they did not rip as easily. Choose a starting point for your strip of fabric. I liked to start right next to the gold hanger thing but it’s not necessary. Then add a dot of hot glue and put your fabric strip in place. Start wrapping it around carefully, adding dots of hot glue where necessary. You will have to use a few strips per ball. 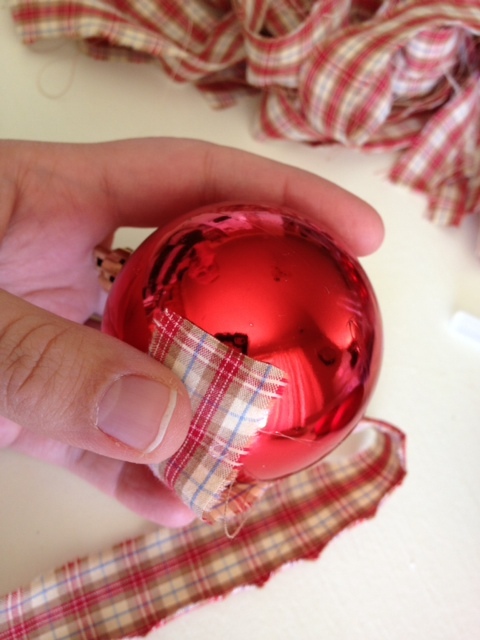 When the entire ball is covered, just make sure the end is glued down tight and not obviously sticking up in a weird place and voila! All done. Toldja it was easy. You didn’t even need a tutorial for this! These ARE adorable. I don’t have any plaid at the moment but for things like this I’ll often look for shirts to use at garage sales! That season is past, so I might have to get crazy and buy a shirt at DI for this. LOVE the plaid! So cute, I might have to make these!! So don’t be mad when my tree looks just like yours!! Kraft paper wrappings are so great with a country tree. I did that one year and stenciled each one. You noticed, I said one year. It was so pretty but so much work.. Love the balls. Have you made an angel with the strips! Could u please tell me more about the Plaid Angels? I love plaids. 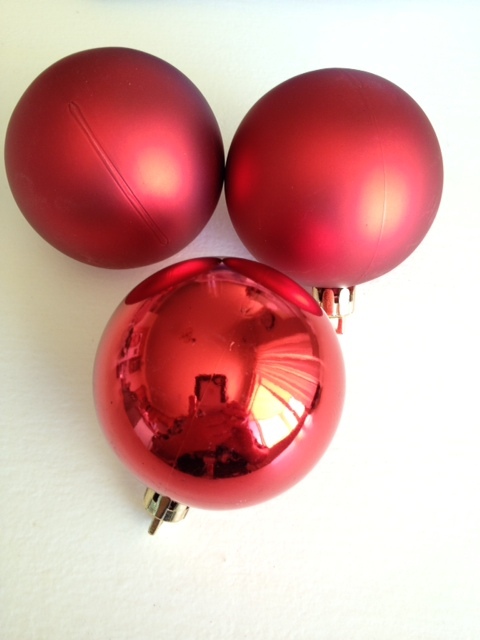 don’t throw out those old ornaments with dings, scratches and knicks. 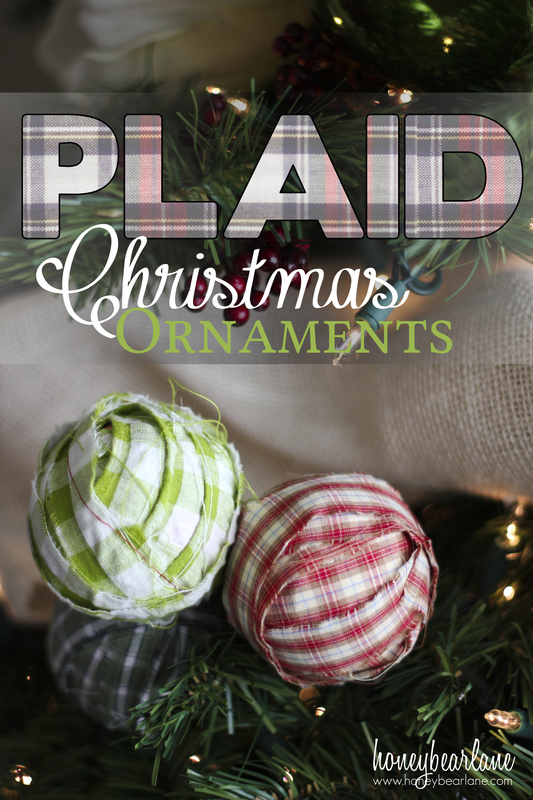 Get way to use all those scraps of fabric and reuse the old ornaments. Great idea, love them. These are so cute. I love plaid this time of year. Can’t wait to see the whole tree done. I love this idea. B ut the way they made these looks so messy. The top is more of what im yalking about. On the bottom u can get a cute bead and hot glue it on so u dont see all those edges. Great idea ..I just think it needs work to make it Excellent.